Good question. It all started innocently enough... I keep photos of my stuff for insurance purposes, and I decided to scan some of them in for safekeeping. But really, I love talking about music, the physics of music, and the technology of music. I once was a full-time musical technologist; for about six years I wrote embedded software for Gulbransen's MIDI controllers and also for their digital pianos which were OEM'd by Samick, Daweoo, and a couple other companies. It was an interesting job, and I'm proud of the work I did there. The technology of music is just a fascinating thing. If you're ever in Munich, you should check out the musical instrument section of the Deutches Museum, which is sort of their version of the Smithsonian, only much cooler. They've got huge exhibits on everything from biotechnology to tunnel-building, but their musical instrument collection is particularly remarkable. First of all, all the instruments are kept in playing condition, but also, they have a number of displays dedicated to the underlying technology of music. One tiny example: they have an amazing display dedicated to the evolution of the grand piano action. You don't think about a grand piano being a "technological" instrument, but it is. Bartolomeo Cristofori is generally credited with the invention of the piano in the very early 18th century. Before that time, the keyboard instrument of the day was the haprischord. A central feature of Cristofori's technology was the "escapement" piano action - he developed a mechanism that allowed the piano's hammer to strike the strings and then fall away automatically. This, along with the fact that the piano note could be played softly (piano) and loudly (forte) was a radical, monumental technological breakthrough. Really Big News, this thing was. Since Cristofori's time, a number of advancements had been made. 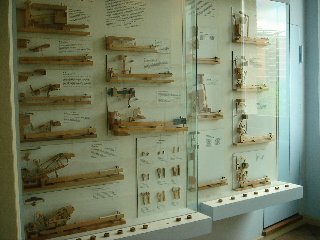 So at the Deutsches Museum, they have a bunch of old pianos, but they also have an working display where they have single keys from a couple dozen different pianos built over several hundred years. But they're not just on display, you can press buttons which actuate the keys so you can watch up close, in cross section, how everything works, so you can see the subtle advances made over the years. And that's a tiny fraction of what they have there, they have a ton of other great things and some pretty crazy instruments.. It's just an amazing place - I cannot say enough good things about the Deutsches Museum. I just love the idea of some guy working away in his shop in Italy, comes out with this pianoforte thing and boom, music is changed forever. The NAMM show is another worthwhile, if exhausting venture. Every year I go to see all the new toys that come out, and marvel at the sometimes bizarre way they're marketed. And lastly, I've been motivated by the other gear-head pages that have informed and inspired me, particularly the many Hammond organ pages, which is where I started. After all, music is not truly music until it is shared, and likewise music geekery must also be shared. There is a tremendous amount of information available on the internet, some of it is great and some of it is total crap. To some degree I suppose this might also be said of these pages. With that caveat, I offer my contribution to the load-o-crap you can find on the net. Having owned a lot of funky keyboards, on these pages I pay homage to the ones I liked, and make fun of the ones I didn't. Hopefully you'll find this information helpful, or amusing, or something. Feel free to email any comments to the address at the top of the screen. I get a lot of email, though, so please be patient if it takes me a while to get back to you. Also, please don't write if it's just to ask where to buy a Hammond organ. I'm not in the business of buying and selling Hammonds, so I'm really not the guy to ask. My best advice is to check Craigslist or your local paper for garage sales. Church and other charity rummage sales are often a goldmine too. You might also look for the Hammond techs in your local yellow pages. They will often have instruments for sale or know who does. By the way, my name is Dave and I play keyboards in two San Diego jambands, Travel Agents and Tic Tac Toast. As I said, I've owned a lot of funky keyboards. I periodically go though binge-and-purge cycles with equipment. Usually things will settle down and after a dormant period things will pick up again. I'm not really into synth sounds and layers and all that crap. Really, I just play piano and organ, and I'd be happy with a great acoustic piano, and great Rhodes, and a great Hamond sound. That's it, that's all I need. Doesn't seem like a lot to ask, huh? You'd think I would have had the equipment thing nailed down a long time ago. You'd think. What I'm finding is that since I don't gig with a real Hammond B-3 or a real grand piano, what I end up doing is every so often trying to optimize my setup either for weight/complexity or sound quality. It's quite a trade-off when you consider that what I want to gig with weighs maybe 2000 pounds, and what I'm willing to cart to gigs weighs maybe 200 pounds. So really, this page is about the quest for decent Hammond and piano sounds in a reasonably small package. The current page has info on the equipment I'm gigging with right now. Use the links on the left to navigate through the various equipment pages here. A completely gratuitous shot of me jamming with the Grateful Dead's Tom Constanten. 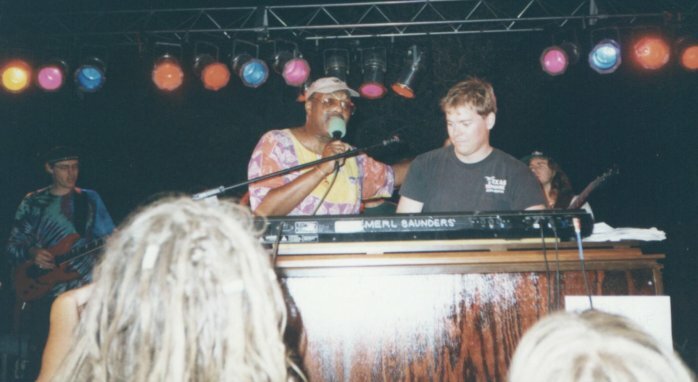 And one with Merl Saunders.